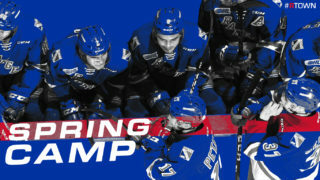 Jeremy Bracco came into Sunday’s game versus the Guelph Storm with the OHL’s longest point streak of the season. Come game time, he made sure that streak was extended. 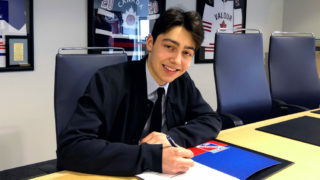 Bracco registered a four-point night – two goals and two assists – to help propel the Kitchener Rangers (14-7-0-1) to a 6-3 win over the Storm (8-12-2-1) in front of 7,072 fans at the Kitchener Memorial Auditorium on Sunday afternoon. The win was the third straight for the Rangers, who earned six of a possible eight points in four games played over the course of the last five and a half days. Bracco’s season long point streak now extends to 19 games, including 16 goals and 24 assists for 40 points. 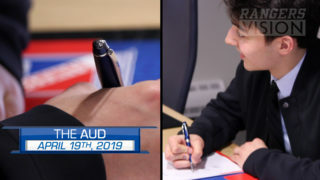 Adam Mascherin – who finished the afternoon with a goal and an assist – has now registered points in all 11 games he’s played at the Aud this season (10-13=23). Rookie point scoring leader Greg Meireles also added to his running totals, notching a goal and an assist while upping his production to six goals and 21 points in 22 games played. Sunday marked the first start of the season for Rangers’ netminder Luke Richardson (1-0-0-0) and the Barrie, ON native was solid, making 33 saves on 36 shots. Anthony Popovich started in goal for the Storm and was dealt the loss, surrendering six goals despite making 44 saves. Giovanni Vallati and Nick McHugh were the other goal scorers for the Rangers, who finally get a few days rest before they’re back on the road on Wednesday night in Sarnia. Bracco opened the scoring for the Rangers on their first shot of the game, as he forced a turnover at the Rangers blue line and broke in on Popovich all alone, beating the goaltender for his 15th of the season. The goal was unassisted at 1:16. The Storm would even things up at 1-1 as Givani Smith capitalized on a Guelph power play, poking the puck past Richardson from the top of the blue paint. Ryan Merkley and Albert Michnac picked up the assists on the goal, which came at 16:22. Kitchener would answer quickly, however, as Vallati tallied his third of the season with a pretty toe-drag and quick release from just above the hash marks to restore the Rangers lead, 2-1, at 16:58. Riley Damiani and Bracco picked up the assists on the goal, which closed out first period scoring. Shots after 20 minutes were 19-11 in favour of the Rangers. 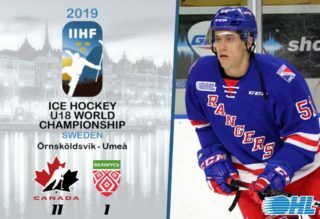 Bracco picked up his second goal of the game – and third point – just 54 seconds into the second period, giving the Rangers a 3-1 lead with a pretty tip-in in front of the Storm goal from Elijah Roberts and Mason Kohn. At 12:19 the Storm again cut the Rangers lead to one, as Jake Bricknell scored his third goal in two games to make it 3-2 Kitchener, assisted by Kyle Rhodes. McHugh restored the two-goal lead for the home team with just 3:29 to play in the middle period, giving the Rangers a 4-2 lead heading into the second intermission, unassisted. Shots on goal in the second period were 14-12 Guelph for a two-period total of 31-25 Kitchener. Matt Hotchkiss banked a Nick Deakin-Poot rebound in front of Richardson to cut the Rangers lead to 4-3 just 3:10 into the third period, with Isaac Ratcliffe earning the second assist. Mascherin’s season long point streak at the Aud continued when he teamed up with Meireles on a 2-on-1 and beat Popovich, giving the Rangers a 5-3 lead at 8:24. With the second assist on the goal, Joseph Garreffa has registered points (2G, 7A) in each of his last five games. Meireles iced the victory for the Rangers by scoring his sixth goal of the season and second point of the night, assisted by Mascherin and Bracco, making it 6-3 Rangers at 11:38. Final shots on goal were 50-36 Kitchener, including 19-11 Rangers in the third period. Kitchener was 0-for-4 on the power play, while Guelph was 1-for-4 with the man advantage. With three successful penalty kills, Heffner Lexus Toyota graciously donates another $30 to the Heffner Lexus Toyota PK Tally for a running total this season of $740 in support of Sun Life Financial Kids in Gear. Damiani (KIT) (3), Meireles (KIT) (2), and Bracco (KIT) (1) were selected as the Three Stars of the Game. The Rangers are back in action mid-week when they take to the road to face the Sarnia Sting on Wednesday, November 23 at 7:05pm. They return home to the Aud on Friday, November 25 when they host the Owen Sound Attack at 7:30pm.